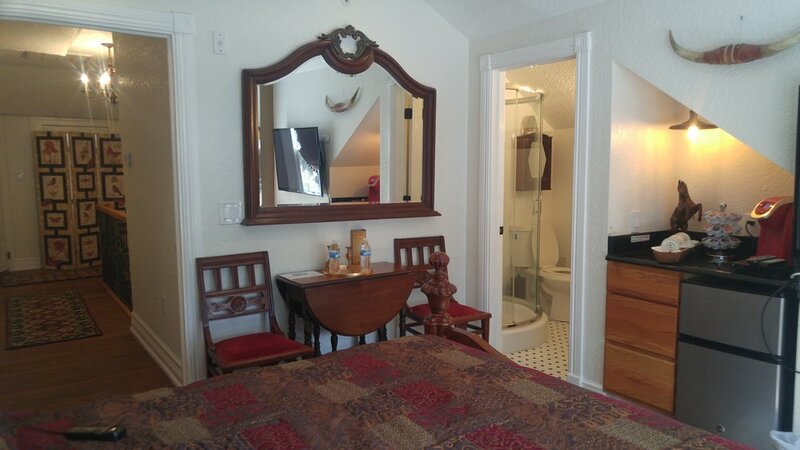 Overlooking Clyde Ave and an Oak tree planted in the 1920's, the Dancing Horse room contains a King Bed, en-suite bathroom with shower, cable TV, free wi-fi, Keurig, Refrigerator. Lock-off room with extra twin available for extra fee. The Dancing Horse Room in Kapp and Kappy B&B features a view of a 1910 cottage and an Oak tree planted in the late 1920's. 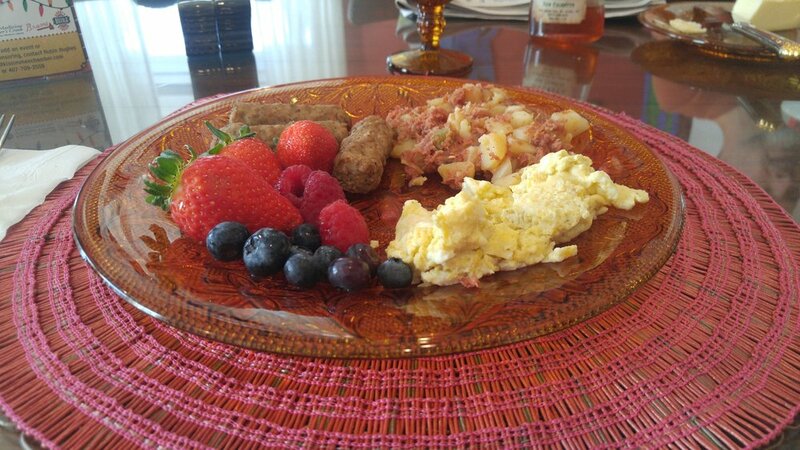 Kapp and Kappy B&B is walking distance from restaurants, bars and boutiques in Historic Downtown Kissimmee. 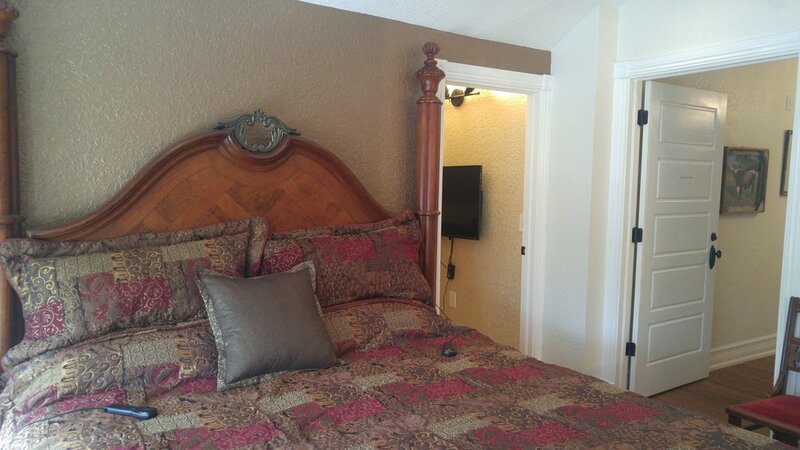 The Dancing Horse Room includes an e-suite bathroom with shower, ceiling fan, refrigerator, Keurig Coffee Maker, Flat Screen TV, free wifi, sitting area, and a King-sized bed with dual adjust-a-rest features. This room has a second lock-off sleeping area. This lock-off area is booked separately, sleeps 1-2 additional guests, and includes a separate television and a twin, trundle bed. Why Is this the Dancing Horse Room? A prominent Kissimmee family with the surname Autrey resided at 21 N Clyde Ave from 1925 until 2005. Katharine Autrey, who resided at 21 N Clyde from 1925 - 2005, was a charter member of the Silver Spurs Club when it was formed in 1941. In 1984 she became office manager for the club and she continued working there until 1998. After that, she continued to support the rodeo association. She received the Silver Spurs Club Lifetime Achievement Award in 1994 for her significant contribution to it. Her nicknames were "Kat" and "Kappy". Kappy was a founding member of the Silver Spurs Rodeo and had many interests including photography, family and friends. In honor of Kappy, we added the horse to the logo and Kappy to the name of the B&B. The Dancing Horse room is a nod to Kappy's participation in creating the quadrille at Silver Spurs - square dancing horses! "The famous silver spurs horseback quadrille comprised of sixteen horses and riders representing renowned families who names are found throughout the pages of history of the South's cattle industry, performing at Semi-annual Kissimmee Rodeos and command performances for many noteables, Kissimmee, Fla"
Hannau, H. W. Famous Silver Spurs Horseback Quadrille. 19--. Color postcard, 9 x 14 cm. State Archives of Florida, Florida Memory. <https://www.floridamemory.com/items/show/163016>, accessed 17 April 2018.